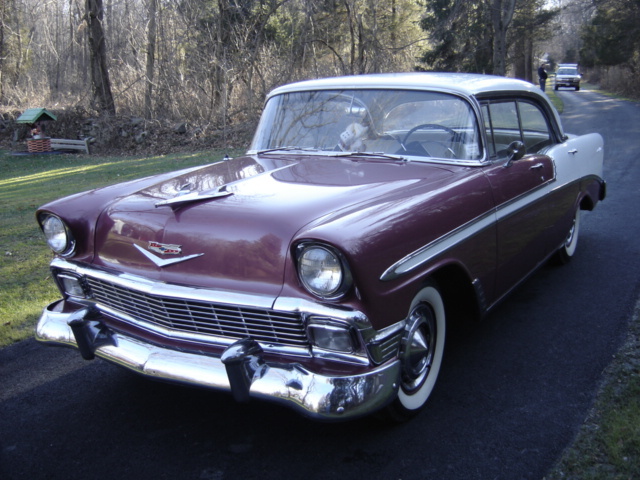 If you are a lover of Tri-Five chevys,then take just a minute & check this beauty out.Pictured here is a Very original,Totally unmolested,Numbers matching 1956 Belair 4 Dr Hardtop. Older restoration of a super solid 79K car.Arrow straight.Paint shows great.Very nice chrome & brightwork.Fantastic undercarriage. Ultra rare correct Dusk Plum / India Ivory color. Super nice Charcoal / White interior. Everything works except clock. Am radio plays great! First year of the 4 dr hardtop. This car very low production number.